I thought this was pretty cool. Diamond Select Toys sent along this cool stop motion video featuring their Universal Monster Select Figures. What happens when the Universal Monsters play host to Halloween Trick r’ Treaters? Find out in the video below. After the jump, you’ll find a bit more info on the video. In the latest wave of Universal Monsters Select Figures from Diamond Select Toys, fans finally had a chance to own a true rival to the monsters. Unlike many of the designs in the series, Van Helsing is based on a completely original design by sculptor Jean St. Jean. The latest series also features a phenomenal Creature From The Black Lagoon and and all new Son of Frankenstein. Today we have a gallery and review for the Monster Hunter Van Helsing Select Figure. 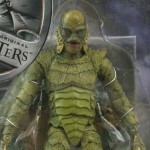 You can find all of the Universal Monster Select Figures at DiamondSelectToys.com. After the jump you’ll find the review and 45 photos. 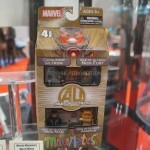 Next week, the comic shop versions of these hit. They will include all new figure bases for display. Read on for all the images and much more info.